Every once in a while, Sonia and I will get so busy that we'll go a few weeks without a Trader Joe's run, and we'll glance in the cupboard and realize there are no new TJ's products to review. I freely admit this was one of those occasions. 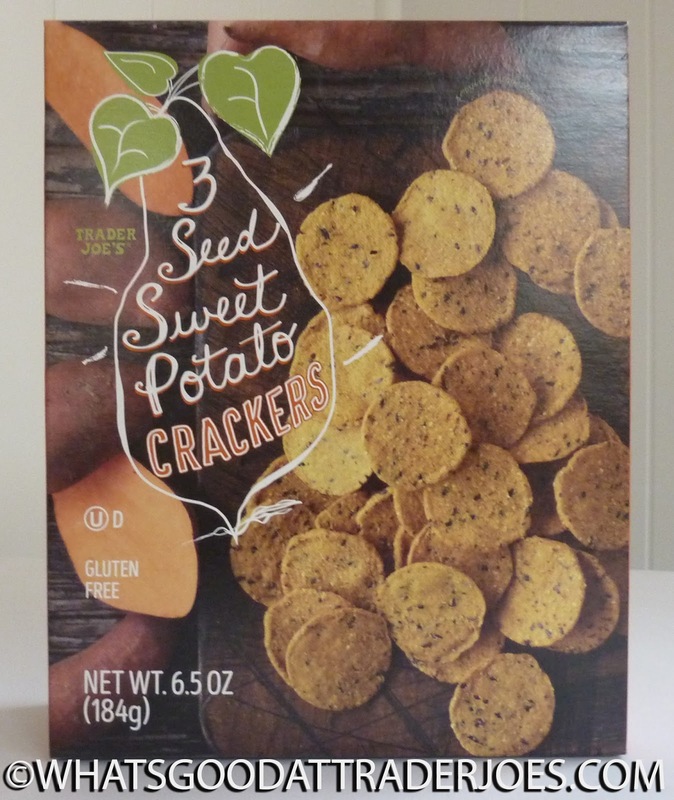 Fortunately, there was one product we bought a while back that hadn't been reviewed at the time of purchase: these "sweet potato" crackers. We're pretty sure this item is still available, although the post about them on traderjoes.com has already been archived. They also offered a 3 seed beet flavor that we skipped. First off, these snacks didn't taste a whole lot like sweet potato. Barely a hint. They tasted much more like traditional corn-based tortilla chips, but with a nice seedy nuttiness. Likewise, they behaved like little round "chips" rather than "crackers," despite clearly being marketed as the latter. 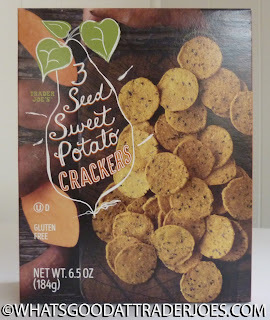 If you've tried the Sweet Potato Tortilla Chips—again, not 100% sure they're still on Trader Joe's shelves currently—you'll know that despite functioning as tortilla chips, they actually tasted noticeably like sweet potato, as observed by Russ and Sandy. For $1.99 per box, the value isn't bad at all. There are plenty of chips, er, crackers, in the package. By virtue of their diminutive size, they work well in soups, although I'd much rather have dipped them in salsa or queso sauce like real tortilla chips. They're crispy, crunchy, salty, slightly oily, and as mentioned before, seedy. I think in many ways the beet flavor would probably work better, since there's more earthiness in the flavor of a beet that might blend a little better with the taste of flax, chia, and sesame seeds. They're gluten-free and kosher, and not a bad value for the price. We're certainly not hating on them, but we've seen at least one sweet potato chip/cracker in recent memory that's a little tastier. Looks like it'll be three stars from me again and three and a half from Sonia. These reminded me of the inferior old-style sweet potato tortilla chips they used to make. I like the beet crackers more than the sweet potato ones. You have to try them!! Yeah we might still pick those up sometime soon.